PHOTO BY JILL GOSCHE A 2006 Dodge Ram 2500 left the roadway and struck a pole, phone box, tree stump, tree and house Monday. 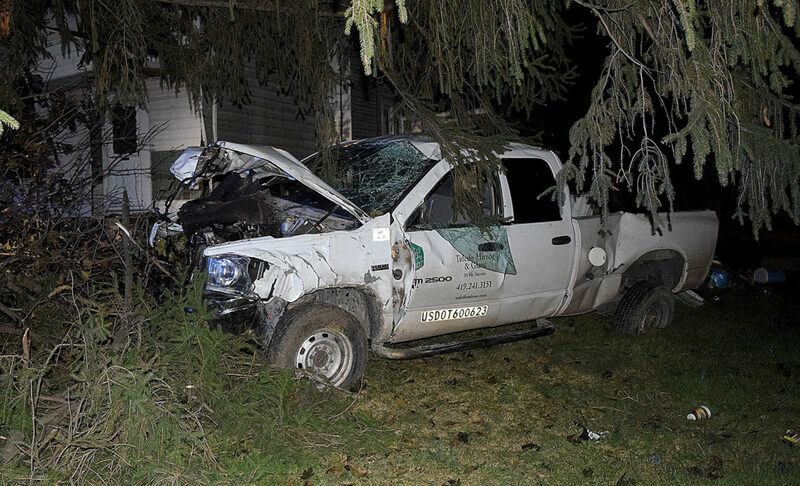 A Sycamore man was hurt when the Toledo Mirror & Glass truck he was driving went off SR 53 and struck a utility pole, phone box, tree stump, tree and house Monday morning. Trooper Jake Mellinger of the Fremont post of State Highway Patrol said James Schock II, 44, was driving a 2006 Dodge Ram 2500 north on SR 53. It went off the left side of the road and came to rest in the yard at 1624 N. SR 53. Mellinger said Schock was not wearing a seatbelt and was taken to Mercy Health – Tiffin Hospital. He was cited with failure to control, Mellinger said. Personnel from Tiffin Fire Rescue Division, Clinton Township Volunteer Fire Department, Seneca County Sheriff’s Office, State Highway Patrol, American Electric Power and D&D Total Repair responded to the accident, which was reported about 6 a.m. Separately, rescue crews responded to an accident on North TR 111 about noon Monday. Mellinger said Leota Dewald, 87, of Tiffin, was driving a 1999 Chevrolet Tahoe south in the northbound lane, getting mail from a mailbox. A 2002 Oldsmobile Alero, driven by Melissa Harrison, 21, of Tiffin, was southbound on TR 111. Dewald made an unsafe right turn into a private drive, and her vehicle was struck by the Oldsmobile Alero, Mellinger said. Both vehicles went off the right side of the road, and the Tahoe struck a rock. Mellinger said Harrison and her passenger, Ryan Cline, 21, of Tiffin, were taken to Mercy Health – Tiffin Hospital. Dewald was cited with making an unsafe turn and was not hurt. Everybody was wearing seatbelts, Mellinger said. Personnel from Bascom EMS, Bascom Joint Fire District and the Echo unit responded to the accident.